I live fairly close to Altoona, PA, which is the home of the Altoona Curve. They are the Pirates' AA affiliate, and as such get a pretty constant stream of prospects that go through the club, only to arrive in Pittsburgh a year or so later. I've long wanted to pay closer attention to my "local" club. I'm heading to a game in a little over a week, so I thought I'd do a short post profiling the Curve's starting lineup. 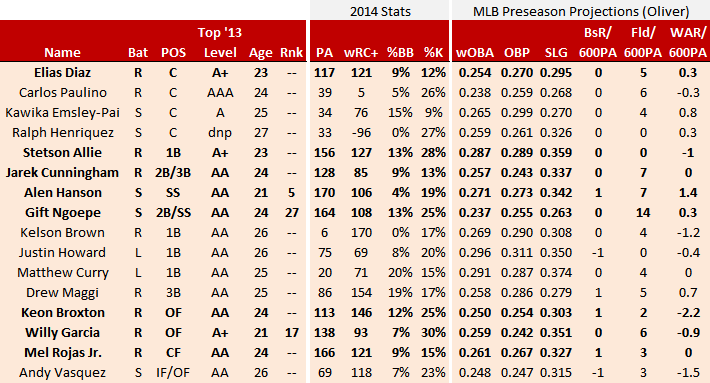 The "Rank" I'm reporting below is from Chris St. John's consensus preseason prospect rankings. They aren't perfect, but I'm more interested in who is on the prospect radar than who is the #8 vs. #9 prospect in the system. All projections are courtesy of Oliver, and are preseason projections. Bold-faced players are the team's regulars. Hanson is the clear top prospect among the position players--you could argue he might be the only one--ranking in the top-10 on pretty much everyone's list. While there are apparently some questions about his defense, his fielding projection is quite strong (though shy of Gift Ngoepe's fielding projection). He is (along with Willy Garcia) the youngest player on the team, and yet projects with the second-best MLB wOBA of anyone on the ballclub. Offensively, he's hit solidly thus far in his second look at AA pitching (half season last year), and is showing good improvement from last year. But I think it's worth noting that he has the lowest walk rate on his club among the starters. He walked better at lower levels, but has yet to do so at AA. The former pitching prospect-turned position player is known as a power threat, and he has hit 8 home runs thus far after hitting 21 last year. He apparently revamped his swing a bit from last season. It hasn't changed his peripheral numbers, but he's continued to hit very well in AA after mashing his way through A-ball last year. If he continues to hit like this, I think he's likely to show up in some of next years' prospect lists. At 24, Keon is a getting to be a bit old for this level. But he's had a lot of fun this season, which is his first with the Pirates after spending his career with the Diamondbacks. He has posted his best wOBA of his career (so far) along with the lowest strikeout rate of his career. I don't know much about him, but I did find it amusing that he once beat out Paul Goldschmidt for the 10th spot on Marc Hulet's 2011 Arizona Diamondbacks top 10. Whoops! Willy Garcia is the other 21-year old on this squad, and has been a below-average hitter while piling on the strikeouts in the early part of the season. He had a decent full year in High-A ball last year, however, so it may be best to let him fight through his struggles in AA. Gift Ngoepe was one of the players I got to see in Altoona last season. He's a fun, scrappy little guy who plays great defense up the middle (last year at shortstop, this year at 2B). He's also off to a nice start with the bat...but unfortunately, his lack of power and ample contact issues will probably prevent him from making much of an impact at the major league level. A look at the Curve's pitching will come some other night!